Ice shelves are permanent floating sheets of ice that connect to a landmass. Most of the world's ice shelves hug the coast of Antarctica. However, ice shelves can also form wherever ice flows from land into cold ocean waters, including some glaciers in the Northern Hemisphere. The northern coast of Canada's Ellesmere Island is home to several well-known ice shelves, among them the Markham and the Ward Hunt ice shelves. How do ice shelves form? Ice from enormous ice sheets slowly oozes into the sea through glaciers and ice streams. If the ocean is cold enough, that newly arrived ice doesn't melt right away. Instead it may float on the surface and grow larger as glacial ice behind it continues to flow into the sea. Along protected coastlines, the resulting ice shelves can survive for thousands of years, bolstered by the rock of peninsulas and islands. 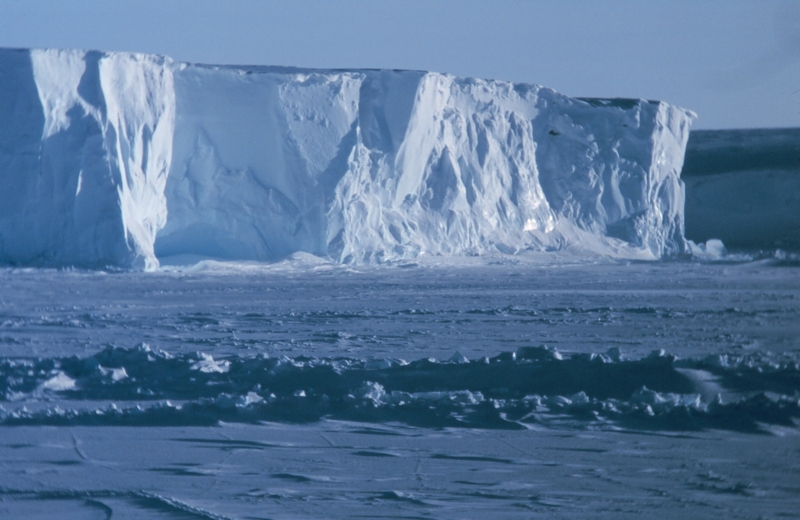 Ice shelves grow when they gain ice from land, and occasionally shrink when icebergs calve off their edges. This give and take helps them maintain a dynamic stability. Why are ice shelves important? Because ice shelves already float in the ocean, they do not contribute directly to sea level rise when they break up. However, ice shelf collapse could contribute to sea level rise indirectly. Ice streams and glaciers constantly push on ice shelves, but the shelves eventually come up against coastal features such as islands and peninsulas, building pressure that slows their movement into the ocean. If an ice shelf collapses, the backpressure disappears. The glaciers that fed into the ice shelf speed up, flowing more quickly out to sea. Glaciers and ice sheets rest on land, so once they flow into the ocean, they contribute to sea level rise. Research suggests that glaciers behind ice shelves may accelerate by as much as five times following a rapid ice shelf retreat. To read about a recent study on such glacial acceleration, see the 2004 news release, Antarctic Glaciers Accelerate in Wake of Ice Shelf Breakup. What's happening to ice shelves? In the last thirty years, scientists have observed a series of unusual ice shelf collapses on the Antarctic Peninsula. 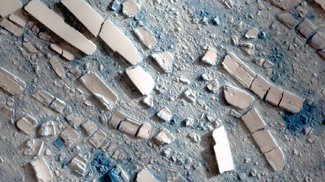 Although it is not unusual for ice shelves to calve large icebergs, that process normally takes months to years, as cracks slowly form in the ice. 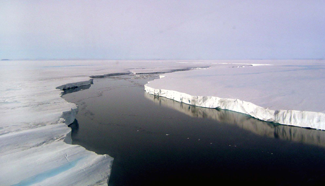 Following a calving, ice shelves generally recover over a period of decades. In recent years, ice shelves on the Antarctic Peninsula and along the northern coast of Canada have experienced rapid disintegration. In March 2008, the Wilkins Ice Shelf in Antarctica retreated by more than 400 square kilometers (160 square miles). Later that summer, several ice shelves along Ellesmere Island in Northern Canada broke up in a matter of days. In contrast, the collapses in previous years happened over a period of weeks, leaving a soup of chunky ice and small icebergs. The remaining ice shelves retreated by as much as 90 percent, and several have experienced repeated collapses. For more information on recent collapses, see Wilkins Ice Shelf Breakup Events and Larsen Ice Shelf Breakup Events. To learn more about the current state of ice shelves, see State of the Cryosphere: Ice Shelves. What causes an ice shelf to collapse? Scientists think that the recent ice shelf collapses in both the Arctic and Antarctica are related to climate change. 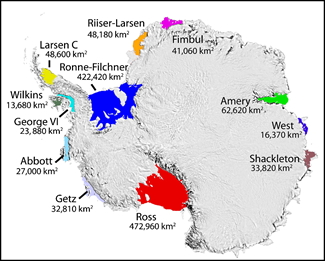 Most of the rapidly retreating ice shelves in Antarctica are located on the Antarctic Peninsula. The Antarctic Peninsula juts north towards South America, into warmer waters. The peninsula has warmed 2.5 degrees Celsius (4.5 degrees Fahrenheit) since 1950, making it one of the fastest-warming places on Earth. Scientists attributed rapid ice shelf collapse to warmer air and water temperatures, as well as increased melt on the ice shelf surface. Retreating sea ice may also play a role. Warm air melts the ice shelf surface, forming ponds of meltwater. As the water trickles down through small cracks in the ice shelf, it deepens, erodes, and expands those cracks. In a separate process, warmer water melts the ice shelf from below, thinning it and making it more vulnerable to cracking. Scientists have observed both processes in all the ice shelves that have rapidly retreated in recent years. However, warm temperatures alone do not fully explain rapid ice shelf collapse. Recent research suggests that waning sea ice surrounding the Antarctic Peninsula and the Arctic ice shelves in Canada might also have contributed to the recent collapses. Sea ice provides a layer of protection between an ice shelf and the surrounding ocean, muting the power of large waves and storms. As sea ice decreases, more waves buffet the ice shelves. The largest waves can buckle and bend an ice shelf, increasing instability and possibly contributing to a collapse. To learn more about research on ice shelf breakup, see the IceTrek project Web site. State of the Cryosphere: Ice Shelves. 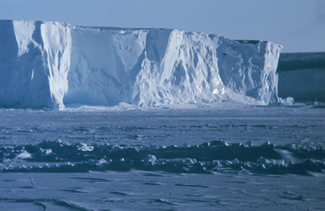 Find more in-depth information about ice shelves. Larsen Ice Shelf Breakup Events. Browse news releases and images related to breakups on the Larsen Ice Shelf. Wilkins Ice Shelf Breakup Events. Read news releases and find images related to breakups on the Wilkins Ice Shelf. NSIDC distributes scientific data sets related to ice shelves. See Advanced Data Search to learn more about our data holdings. Earth Observation for Polar Monitoring: Recent views of Antarctic Ice Shelves and Coastline: Regular images of Antarctic ice shelves and coastline from Envisat ASAR data (http://www.polarview.aq/iceshelf/iceshelf.php). European Space Association, Keeping an eye on the Wilkins Ice Shelf: Recent images of the Wilkins Ice Shelf, updated year-round (http://www.esa.int/Our_Activities/Observing_the_Earth/Keeping_an_eye_on_Wilkins_Ice_Shelf).